New year, new look! With the decorations down, the family gone, and cold winter days ahead, now might be the perfect time to roll up your sleeves and give a couple spaces in your home a refresh, without breaking the bank or taking up all your free time. That’s where we come in. With Metrie Complete pre-painted shiplap and moulding, you have everything you need to create a beautiful refresh, minus the painting and long timeline. But, while most interior rooms have a straightforward shiplap installation, we have heard a few questions from our friends and followers that you might be wondering yourself. So today, we’re tackling the questions we hear the most, and showing off a few feature projects from some of our design friends that we know you’ll love. 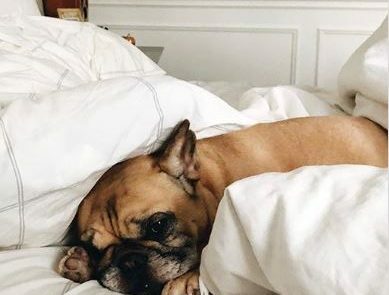 Some of our favorite design bloggers have taken advantage of shiplap DIYs with stunning results. 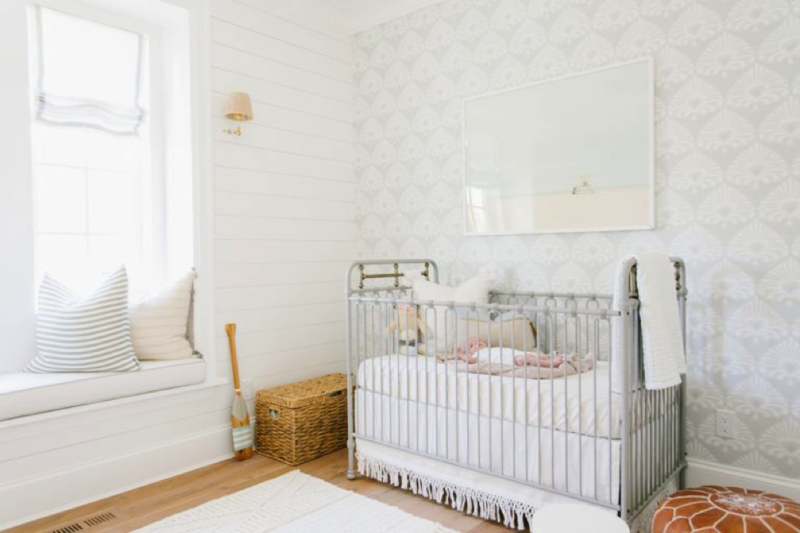 In fact, our dear friend Monika Hibbs transformed her little one’s nursery with shiplap, giving it a pop of visual interest on a tight timeline. We also love shiplap installed vertically for an eye-catching focal point. Steve and Alyssa, of Coco & Jack, blew us away with their shiplap backed built-ins in their living room. 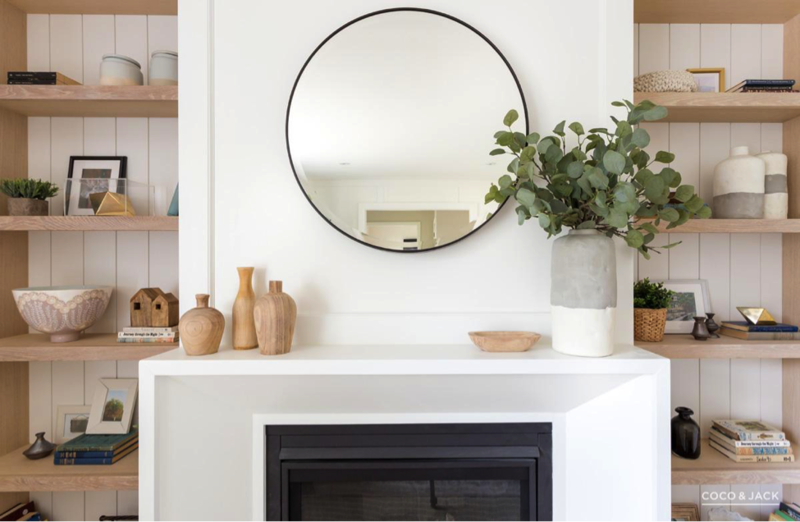 Normally we’d say that a fireplace is a room’s focal point, but there’s no denying the scene-stealing quality of this shiplap install. Can you install shiplap on the ceiling? What about over a popcorn ceiling? Absolutely! And actually, there’s no need to remove the popcorn texture before installing the shiplap. Can you install shiplap in your bathroom? Of course, as long as the shiplap is not directly exposed to standing water. 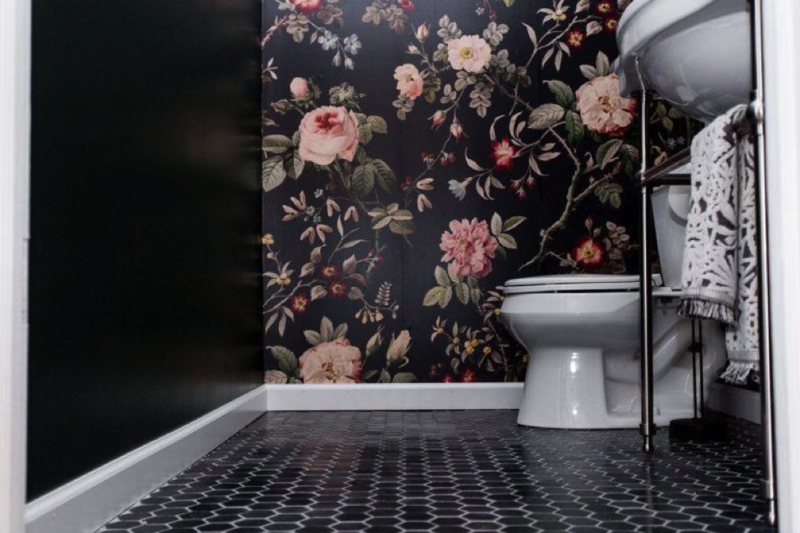 For example, avoid installing directly in a shower, but the shiplap will work just fine in spaces like a powder room. That being said, our shiplap is not meant to be exposed to too much humidity. Inevitably, it will retain moisture and may become damaged if it’s not sealed completely. We recommend that any cut ends be protected with a primer before concealing or touching up with our Metrie Complete touch-up products. Due to the significant temperature fluctuations in most of these spaces, this may cause the shiplap to warp and crack. Similarly, if you’re envisioning shiplap as a backsplash or near kitchen appliances, always consult local building codes for heat-resistant material specifications near cooking surfaces, as traditional heat-resistant materials such as tile or stone may be required. Now that you have plenty of ideas for where to install your shiplap, dive into how to actually do it! You can find a quick tutorial, courtesy of Studio McGee, on our website. If you’re just looking to spruce up your trim, you can use our Metrie Complete pre-painted moulding profiles that are ready to install. For example, you can install new baseboard in a flash with almost no mess! See how Construction2Style did it. Does Metrie Complete moulding and shiplap come in other colors? We love timeless white trim and think you might too. Our pre-painted products come in a crisp, clean Polar White color. 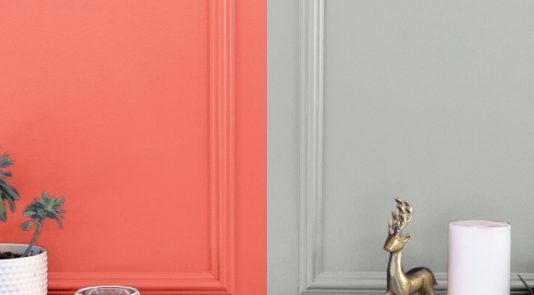 If you’d like to find wall or ceiling paint to match, simply take a piece of the Metrie Complete shiplap or moulding from the store you purchased it from, and head to the paint section. They should be able to color match it perfectly for you! To help your project look pristine for years, there are Finishing Kits available to seal joints and cover nail holes after installation. The kits are expertly color-matched with a wax stick and abrasion pad, and color-matched caulking. These kits are readily available to purchase separately. Ready to get started on your next project? Contact one of our Registered Metrie Dealers for availability and pricing on our Metrie Complete pre-painted interior finishings, Finishing Kits and color-matched caulking. We can’t wait to see your newly updated space! An Accessory Wall? Yes, Please!